Iris Austin, HR Partner at Volvo Trucks, made front page news this week here in Greensboro. 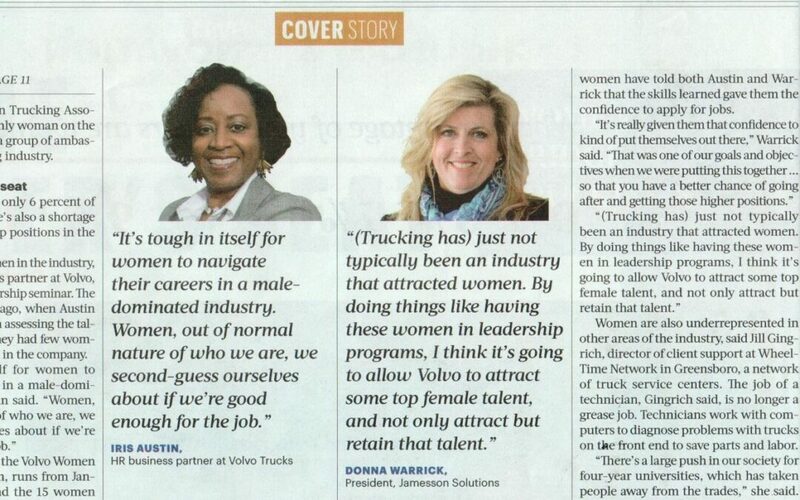 Six months ago, we heard the Triad Business Journal was researching for an upcoming feature on women in trucking. So we told them about the unique women in leadership program that Iris initiated. Jamesson Solutions had worked with Iris to develop the curriculum and we now facilitate the monthly sessions. For the trucking industry this is important because the competitive labor market has everyone scrambling to retain their best people. Historically, trucking has been male dominated. But now it’s vitally important within the industry to not overlook half of the workforce. And one of the best ways to retain women is to let them know they not only have a place in the organization, but also they have the potential to grow and advance without having to leave. Iris’s leadership and her story earned Volvo Trucks a bold cover story. We’re proud to be part of it. What’s your organization’s employee retention plan? Jamesson Solutions can help.